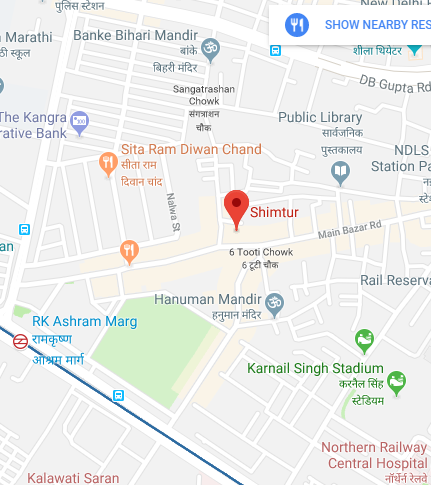 Shim Tur Paharganj Journey - Often touted as a backpackers paradise, it is natural that Paharganj would be a hub of cuisines from all across the globe catering to the tastes of transient backpackers. Many establishments like Jimmy's Pizzeria and several Israeli restaurants have set up shop here for years, bringing the taste of authentic homely cuisine to travellers far away from the open fields and fresh air of their native lands in this dingy clustered neighbourhood in this hot, polluted and overcrowded city. The Shim Tur Paharganj is one such ethnic gem hidden in a dingy alley that caters to aficionados of Korean cuisine, something that has not yet caught on to the palates of local Delhites. A horrid walk through crowded bylanes followed by a climb of four flights of stairs up from the horrifyingly dirty and shabby ground floor landing is almost enough to dishearten you before you reach the terrace to be greeted by the warm and pungent smells of Korean food being cooked and are ushered in to breezy bamboo covered sitting area with wooden tables and chairs lending it an aesthetic feel. The signature dish here is the Korean barbeque pork, which you grill yourself on a makeshift mobile grill brought to your table. Although it takes some time and effort on your part to carefully cook the soft raw meat and watch it turn from a pink and white to a warm greyish brown, it is worth each moment to watch the transition and even more so when savoring the absolutely delicious pieces of meat dripping with the fat you just cooked. This stupendous flavour of the meat is unique to meats in Korean barbeque: pork belly in this case. 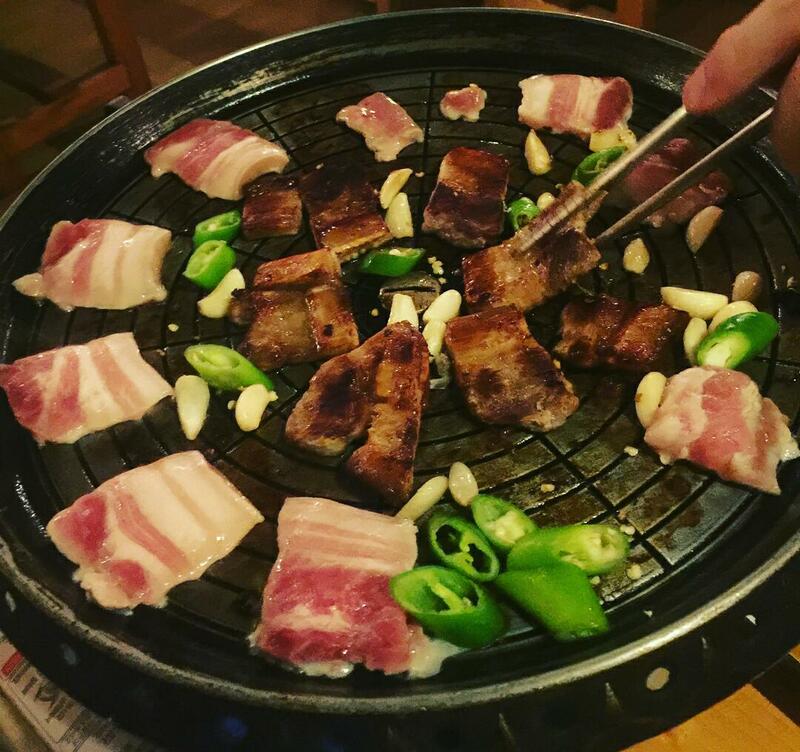 This scribe has had Korean barbeque in Koreatown of LA and can attest to the fact that this meat comes close to it. Like in all barbeques, you can flavour the juicy pieces of meat by rubbing in various sauces and oils provided to you along with the grill, preferably using the brush provided. Several condiments are provided with your meal, no matter what you order. This is itself forms the core experience of your meal here, and indeed the core experience of Korean dining. These include the famous kimchi, widely recognised as being the centrepiece of Korean cuisine. The kimchi was pungent, chewy and had a delicious sour flavour that made us finish it in no time. The waiter obliged us with several refills of the kimchi. Then there was the Korean omelette, which was comprised of thick yet small pieces of egg white omelettes cut into square pieces. Apart from this, there was lettuce that you were supposed to wrap the meat with and eat, a cold potato dish that was easy on the mouth and served as a palate cleanser, as well as a stringy vegetable with a mushroom-like consistency that was delightful to eat. This thus was our first meal in this hidden Korean jewel. The second time we came here with a larger group and were treated to the same starters. However, the occasion demanded that we celebrate with more than just food, and thus a bottle of soju was ordered. Soju is a locally brewed rice wine in Korea. Sort of the equivalent of toddy or mahua in India as in it is easily tapped and fermented even in a domestic setting. It is a sweet tasting brew which is had in shot glasses and is very easily drunk since it does not have any overpowering taste or bitterness that most liquors have. Apart from this, we ordered the Roast Pork in a spicy sauce which was a sweet and spicy sauce. The pork was delicious and soft, and the sauce was also relished to the full despite my normal wariness of sweet gravies. One companion ordered Roast squid with rice that was a pleasant surprise as it was crisp and slightly spicy, perfectly balancing the rubbery texture of the squid. Overall the experience both times was wonderful and we eagerly fantasize about the next trip. Such a pity about the surroundings.